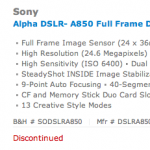 The full frame Sony a850 is now officially discontinued at B&H. The camera was announced in August of 2009. The future of the Sony full frame DSLR line is unclear at that point. Sony did confirm that all future Alpha cameras will have translucent mirror technology.